Or should I say going to hell in a handbasket! Hats off to Rod Kenny of Vancouver for training Shadow to stay put and go along for the ride! Here's what Rod has to say about this amazing feat: This is Shadow's favorite sleeping place. I took him for a ride one night and he seemed to like it. I think the trick is to let them get used to sitting in it first. So, I then I started easy by just pushing my bike up and down the hall with him in the back, and he seemed to really dig it. Lacking a proper cage, I devised a netting system with bamboo tied to the corners of the basket so he couldn't jump out, but would get lots of air. OMG. Cat in a basket. Repeat, cat in a basket! 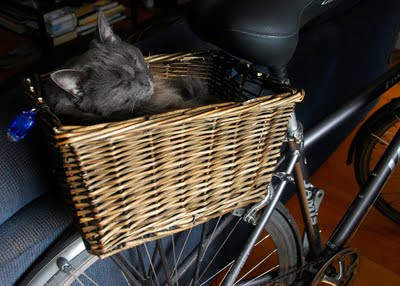 With your permission, this is getting added to the Bike and Cat Gallery? Thanks for letting us know about this Gallery! The picture belongs to Rod Kenny. So you'll have to ask him for purrmission! Dare I say it? The whole thing is so adorable! I wonder if that would work on a Smooth Fox Terrior? We have an English pub delicacy called chicken in a basket, usually served with chips. so cute! looks like my cat godfrey. i don't know if he'd like it in a basket, but i'll have to try.